In 1993, the author set out to try and gain some understanding about school and community in Havens, New Mexico--a place where she had the opportunity to be immersed in border culture, where she could learn how the border figured into everyday life, and where she could pay uninterrupted attention to the issues as they occurred in the personal and professional lives of those who taught in and administered the schools--and in the lives of the students who studied there. This book offers an interpretation that is disciplined by the long hours, days, and months spent in Havens, and by the personal stance the author brings to the study of a place and its people. This book tells the story of Havens from the perspective of what it is, of the present in all of its complexity, and as a window on what might exist in the future in this border community. It begins with a description of Havens and its inevitable interdependence with its Mexican neighbors, followed by an introduction of three "cultural mediators"--two students and one teacher from Havens High School. Focusing on the relationship between the use of Spanish and English, the language landscape in the community and in the schools is laid out. This is followed by a specific description of the development of bilingual education programs in the district, and an introduction of the social structure of the high school, describing the students' interactions across cultural lines. The final chapter presents an alternative metaphor for thinking about the border and identifies markers of opportunity that already exist in Havens as it works toward defining what it means to be a bicultural and binational community. "On the Border of Opportunity: Education, Community, and Language at the U.S.- Mexico Line, can be an informative addition to a variety of courses in teacher education programs, including foundations, bilingual education, and teaching English to speakers of other languages. Also recommended for school and public libraries serving multicultural populations." "Pugach takes on some vexing issues that are pertinent will beyond Havens and considers them thoughtfully. Preservice and inservice teachers with Mexican origin students would gain from this book and find it accessible." 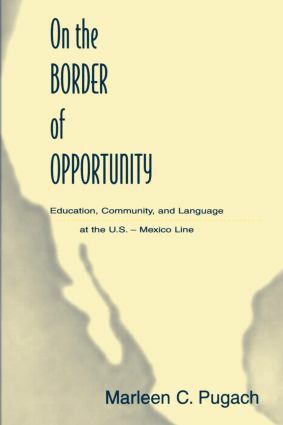 "On the Border of Opportunity engages the reader with a text that weaves together a description of a town and school on the [U.S.-Mexican] border, words of students and teachers, vignettes from Pugach's experiences, and her interpretation of the meaning of her observations and interviews. Pugach casts a positive light on a situation that the media often portrays negatively. She restores hope in the possibility of hospitality and friendliness, without overlooking or underemphasizing the harsh realities of discrimination, economic poverty, and the difficulties of 'fitting in' as well as 'getting in' to 'Anglo' opportunities. Pugach does not fall back on the usual dichotomies of those that have versus those that don't, or people of color versus 'Anglos'; instead, she portrays the complexity of a small town and school where the border is an everyday part of everyone's lives. Students cross the border to school, bringing with them their language and culture, but the border crossing is not a one-way process, as Pugach makes clear." "The strength of this ethnography of a U.S.-Mexican border town and its only high school is its fluidity, both conceptually and narratively, and that fluidity parallels the author's point about Havens, New Mexico, a small town reconfiguring its border identity. With rich detail and seamless narrative, the author captures the fluidity of relationships among Anglos, Mexican-Americans, and Mexicans; the fluidity of the physical border itself which is more porous than not; the fluidity of Spanish usage. As the author notes, there is no rigid rejection or acceptance of the diverse cultures here; rather, the cultures constitute a fusion of various sorts along a continuum. This conceptual fluidity allows for the endless contradictions in the thinking and actions of this town's inhabitants. And this is life as we all know it….Marleen Pugach's ethnography captures the complex relationships among language, social class, and what it means to be an immigrant, the history of a border community, and nestles high school life in the midst of these relationships. She envisions the possibilities that such a border town could hold, and provides ideas for how such possibilities might be articulated, particularly in terms of the school district. Scholars and students in the sociology of education, multicultural education, literacy and language education, and social foundations would enjoy and learn much from this book. It is well written, rich in detail, thoughtfully interpreted…and investigates issues pertinent to all educators." Contents: E.E. Garcia, Foreword. Introduction. "But We're Not in Iowa, You Know." Mediating the Boundary. Crossing the Psychological Border: Language in Havens. Quien Sabe Dos Lenguas Vale por Dos. Getting Along at Havens High. The Limits of Being Neighborly. Epilogue.